If you’re looking for great food at reasonable prices, you have come to the right place. Sherwood Classic Eats LLC offers flavorful burgers, lunch sandwiches, and dinner dishes as well as shakes and other drinks. Our menu features original recipes and specialties like the Goodie Woodies burger and our dessert pastry chimney based on a secret recipe. We serve customers in Barnhart, MO and surrounding areas. 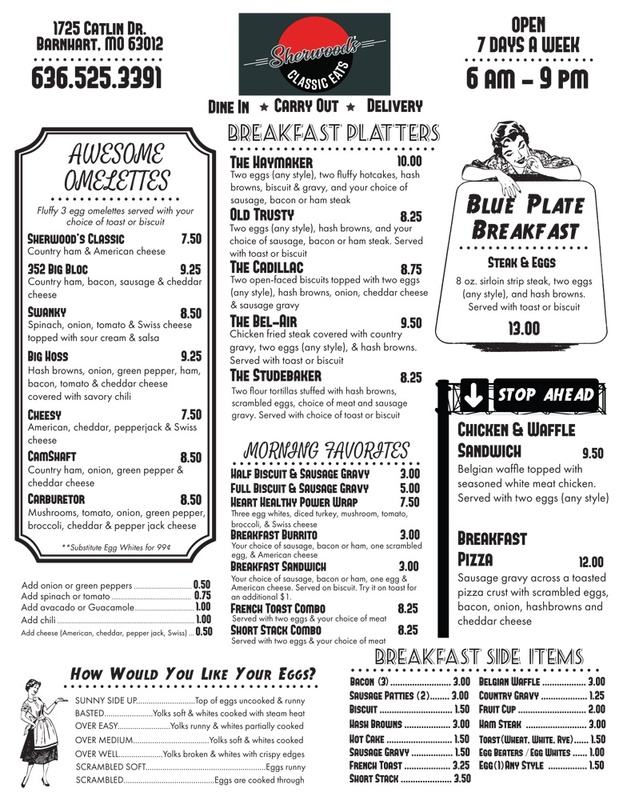 For traditional all-day breakfast and other delicious meals, drop by Sherwood Classic Eats LLC. We are a licensed, family-friendly, and non-smoking burger shop in a convenient location. You can also count on our quick service when you dine with us. Contact us today to ask about our restaurant or to order from our menu. We serve customers in Barnhart, MO and surrounding areas. We accept cash and cards.